New FAQ: Can I review a copy of the invoice my supplier submits to Payment Services? Posted by skyvu on Tuesday, July 17, 2018 in News, Procurement. Procurement Requesters can review invoice information and now, when applicable, view invoice images submitted by our suppliers through the View Life Cycle feature in Oracle Cloud Procurement. 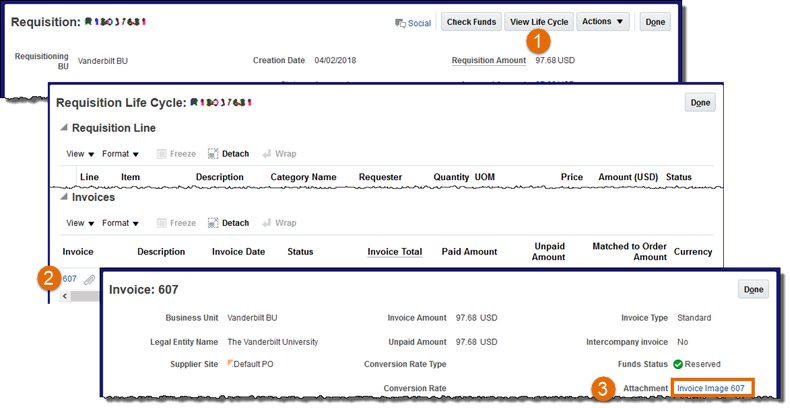 Scroll to the bottom of the page to the Invoices section – if an invoice has been received in Payment Services, you will see a blue invoice hyperlink. The gray paperclip icon indicates that an invoice image is attached. Click the blue invoice hyperlink to view invoice details. If an invoice image is available, click the blue invoice image hyperlink to view the image of the invoice.